Pictured is Ray Glock-Grueneich. 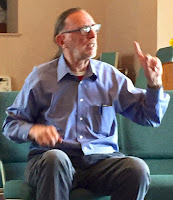 This photograph was taken as Ray was speaking on "religion in China" in the Meeting House of the Santa Cruz Meeting of the Religious Society of Friends (Quakers). Ray gave that talk just last Sunday, and it was both informative and moving. 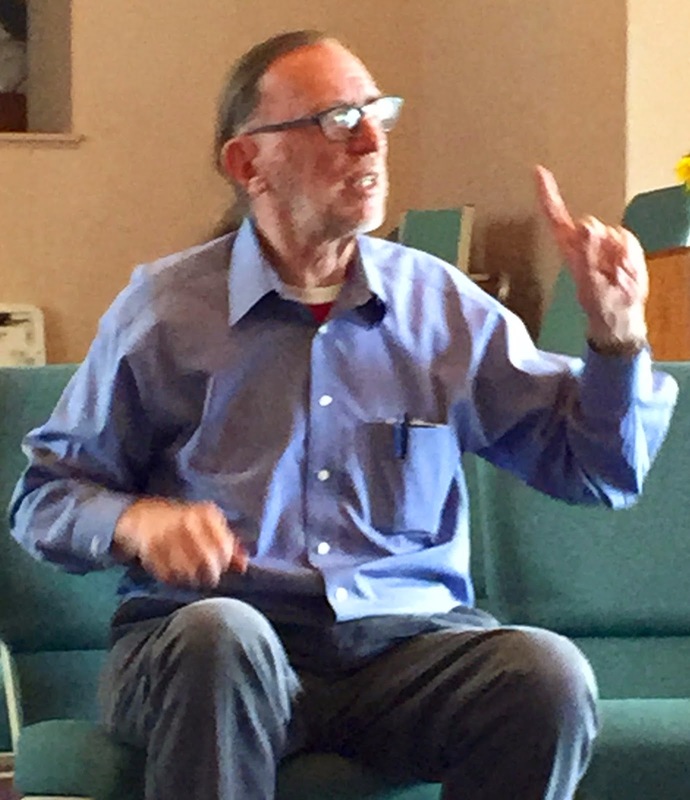 I was very happy to be able to be there, and to hear Ray, and especially because I had been thinking about Ray even before I heard that he was going to be speaking at the Meeting House. Not long ago, I attended a basketball game at the Kaiser-Permanente Arena in downtown Santa Cruz. One of my students from UCSC was playing, and it turned out to be an exciting game. Unfortunately, the UCSC team lost by one point in overtime, but the student from my class was definitely the star of the show. It was a very pleasant evening, seeing old friends and enjoying some exciting college-level women's basketball. However, that basketball evening turned out to be particularly special for me because during the half-time I was approached by someone who was about my own age, whom I didn't recognize, and who said, after introducing himself, that he wanted to thank me, more than forty years later, because I had been his defense attorney in a draft prosecution, in 1972. Because I was successful in defending him, he didn't have to go to jail! Well, my father and I defended a lot of draft resisters and conscientious objectors during the Vietnam War, and we never lost a case. A huge share of the credit for that, however, goes to Ray Glock-Grueneich. He absolutely was, as the Wikipedia article says, an "expert in Selective Service law." Actually, the article says Ray was a "recognized expert," and while I suppose Ray's expertise was recognized by those who knew, I don't think very many people actually knew what a great thing Ray did during the war. The person who approached me at the basketball game, for instance, certainly attributed the successful defense of his case to me. I was the attorney of record, but I can almost guarantee that it was the behind the scenes work that Ray did that probably led to the success in that case. This posting is just my simple statement of appreciation for Ray Glock-Grueneich. I am just passing on the plaudits given to me at that basketball game. Ray is truly an extraordinary person. There are others, like Ray, who do amazing things for others, and who are often unrecognized for their contributions. Anyone in that category should get a shout out for what they have done, even if that shout out comes more than forty years later. Thanks to all, but let me say, especially: Thank you Ray! I don't know anyone who is a smarter, more sincere, and more effective non-violent fighter for justice. And by the way, as I learned from that presentation last Sunday, Ray is now teaching in China, and is still doing those amazing things!